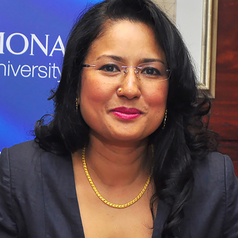 Dr. Sivanes Phillipson is Associate Professor at the Faculty of Education, Monash University. Her research interest and experience focus on family studies in particular parental involvement and expectations of culturally and linguistically diverse and disadvantaged children. Sivanes has been awarded multiple research grants, including a recent Australian Research Council Linkage Project titled Numeracy@Home as the lead chief investigator. She has consulted on multiple projects internationally including the development of measurement tools for parent engagement in schools, family partnership in early checks and child development services. Sivanes has supervised higher degree students to completion in Hong Kong, University of Tasmania and Monash. Sivanes has published widely in books, peer reviewed journals and book chapters. She is the Routledge Series Editor for the Evolving Families Book Series. She is the lead editor of the 2017 Springer book entitled "Engaging families as children's first mathematics educators" that focuses on parent engagement in early learning of mathematics at home.